This will be the 9th book in the series with Konrad Simonsen as the main character. We hope people will enjoy reading it as much as we have enjoyed writing it. This will be the 8th book in the series with Konrad Simonsen as the main character. We hope people will enjoy reading it as much as we have enjoyed writing it. The 27th of October 2016 we publish Mørkemanden in danish. The 27th of October 2016 we publish Mørkemanden in danish. This is book no. 7 in the series with Konrad Simonsen as the main character. The 24th of June 2016 we publish ROSA in danish. 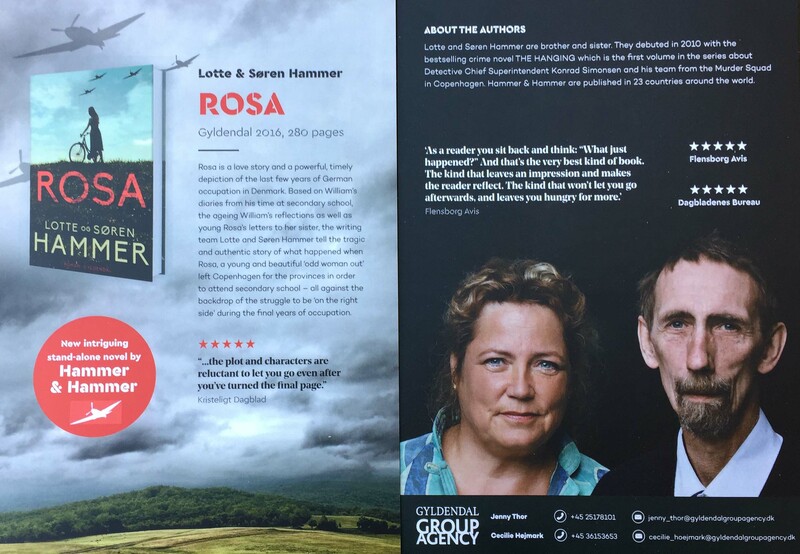 Because ROSA is not a mystery novel, it seems almost like a debut novel for us. We think it has been successful, and now we can only hope that everyone else think the same. 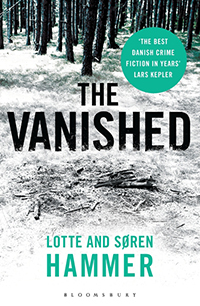 "The Vanished" is the third book in the series about Konrad Simonson. It'll be published in the U.K. on march 24th and in the U.S. later this year. 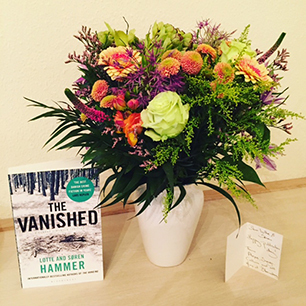 With the announcement, we received this beautiful buket from our publisher Bloomsbury. 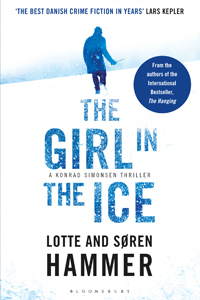 The second book in the series about Konrad Simonson has been published in the U.S, with the title "The Girl in the Ice". The book has received amazing reviews from both Wall Street Journal and Bookreporter.com. The reviews can be read here. A new folder introducing people to our book series. 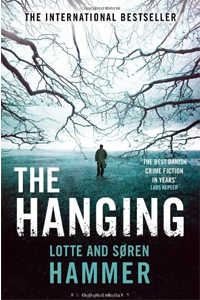 We debuted in 2010, with the bestselling crime novel "The Hanging" (org. title "Svinehunde"), and has it been a ride. We have sold more than 200,000 copies in Denmark alone, and we've been published in 23 countries around the world. We are so thankful for the success we've had, and are still having. In connection with publishing our books in England and the U.S., Gyldendal has made a pamphlet containing info about us, and short summaries and reviews of our books. Book number 6 in the series with Konrad Simonsen "The Revenge" (org. title "Elskede Heidi") has been published in danish on March the 6th 2015. We're happy to say that it got wonderful reviews. The cover for The girl in the ice (org. Alting har sin pris) is now officially done. 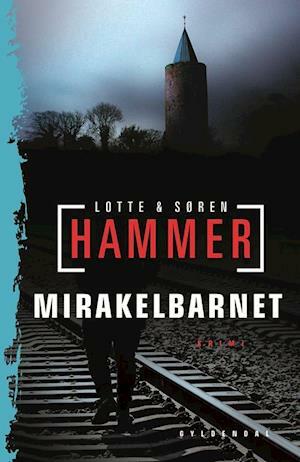 We think it's absolutely stunning :-) The book is the second volume in the Konrad Simonsen thriller series. It's released in England on July 2nd, 2015, and in USA in November 2015. The first volume of the series with Konrad Simonsen as the main character has been a great succes in England. 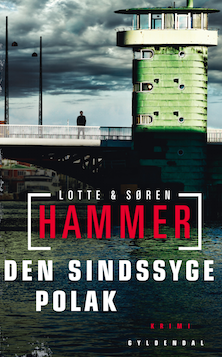 Therefore Gyldendal have just closed a big 4-book deal with Bloomsbury UK and US for Hammer and Hammer's popular crime novels. Book number 5 (org. title "Den Sindssyge Polak") has now been published in Denmark on March 24th 2014. For the sand sculpture exhibition currently running at Hundested Harbour, we have written a nice little fairytale about the small Forest Troll and his time in North Zealand. Vol 1: "The Hanging" has been published in England and USA. 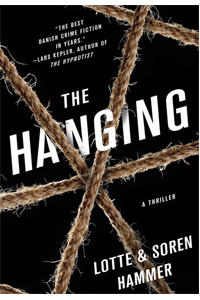 Publishers Weekly writes about "The Hanging". The rights to volume 1 (Svinehunde), have just been sold to country no. 20, Brazil. The rights to volume 1 (Svinehunde), have just been sold to country no. 20, Egypt. Org. title Svinehunde will be published in the USA and England June 2013. The title has been changed to "The hanging". Our first two books will be published in Russia, September this year. The fourth book in the series about Konrad Simonsen and his team will be released in Denmark the 27th of August. The Danish book “Alting har sin pris”(the second in the series) will be published in Germany in the Autumn, titled “Die Frau im Eis”. We are very excited! Bazar in Finland will publish the second book in the series about Konrad simonsen (org.title “Alting har sin pris”) on April 31 this year. The title of the English/American translation of “Svinehunde” has been confirmed. It will be titled “The Beast Within”. The rights to publish the third volume in the series about Konrad Simonson have now been sold to Dutch publisher A.W. Bruna. The book's Dutch title has not yet been determined. 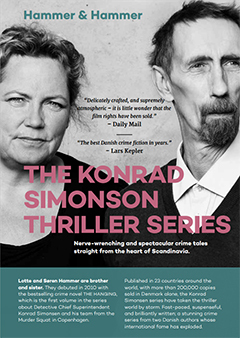 In Autumn 2011 the crime anthology ”More Bitter Almonds” is published by Danish publisher Lindhardt&Ronghof. We have participated alongside 11 other crime writers. This anthology is a sequal to the successful ”Bitter Almonds” which was published in 2010, in which we also had a short story featured. August 29, 2011 the third volume in the crime-novel series, about Konrad Simonson and his team of investigators was published. After a successful debut in France with our first book “The Beast Within”, the French fashion magazine Elle have now published one of our short stories in a booklet alongside their magazine. The film rights have been sold. The film rights to “The Beast Within”(org.title “Svinehunde”) have been bought by “Nordisk Film”. The finished film will most likely not premiere until 2015.